A n engaging introduction to a magnificent and complex lake, its physical and biological makeup and fascinating phenomena. Short essays offer enough detail to satisfy ecologists - in a prose style that anyone can enjoy. 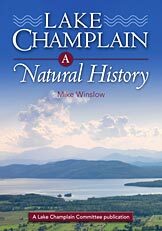 Six sections cover the lake's multifaceted natural systems and the outlook for the future: The Setting; Forces; Phenomena; Living Lake: Plants; Living Lake: Animals; The Future of Lake Champlain. Illustrated with photographs, charts, new sketches and maps. Resources/Bibliography. Index. Mike Winslow has been staff scientist for the non-profit Lake Champlain Committee for seven years. In this capacity he has served on numerous technical bodies; his activities have kept him in touch with the latest studies on Lake Champlain and given him access to the most influential members of the research community. Mr. Winslow is a graduate of St. Lawrence University with a degree in Biology and Environmental Studies. After six years teaching in a variety of settings, he continued his education at the University of Vermont where he received his Masters in Botany. He lives in Vergennes, Vermont with his wife and daughter.